Six million Americans are 90-plus days delinquent. The increasingly turbulent sector of subprime auto loans bubbled to the attention of the Federal Reserve Bank of New York. In its Liberty Street Economics, it worries about the “notable deterioration in the performance of subprime auto loans” – Fed speak for the momentum with which these loans are going to heck. About six million people with subprime credit scores (below 620) are now at least 90 days past due on their payments for their car or truck. The New York Fed worries about the lenders that specialize in these loans, and it worries about the “large number of households” whose vehicles are at risk of repossession: “The increased level of distress associated with subprime loan delinquencies is of significant concern, and likely to have ongoing consequences for affected households,” it says. If the vehicles are repossessed, people might lose their ability to go to work, go to the grocery store, and do the normal things in life that drive the economy forward. Six million people are in that position. Auto loan balances jumped by a breath-taking $32 billion in the third quarter, to $1.135 trillion, according to the New York Fed’s current Household Debt and Credit report today. 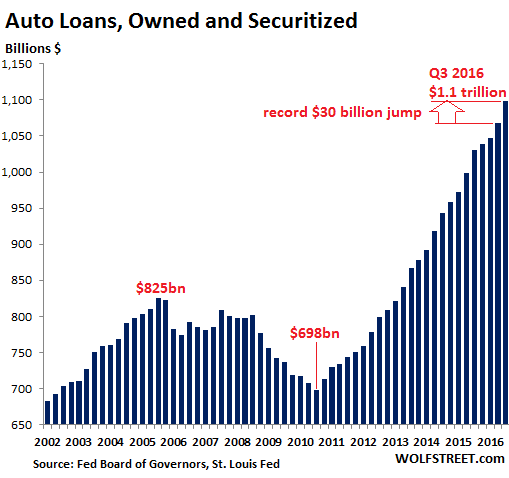 According to the Board of Governors of the Federal Reserve, which released its own set of numbers a little while ago, auto loan balances jumped by $30 billion in Q3, to $1.1 trillion (chart below). Both agree: It was the biggest jump in auto loan originations in US history for any quarter and year-to-date. Of these $1.135 trillion in outstanding balances, banks and credit unions originated 49% ($556 billion). Auto finance companies originated 51% ($579 billion). These auto finance companies, such as Santander Consumer USA, are focused on subprime. Subprime auto loans make up 24% (or $272 billion) of total auto loans. Banks and credit unions originated only 25%, or $68 billion, of these subprime loans. Auto finance companies originated 75%, or $204 billion, of these subprime loans. Subprime auto loans, unlike other auto loans, are very susceptible to economic ups and downs. During the Great Recession, subprime auto loan balances dove. Lenders tightened underwriting standards. Defaulting borrowers saw their vehicles get repossessed. And people with subprime credit scores had trouble buying new cars, one of the reasons auto sales collapsed. 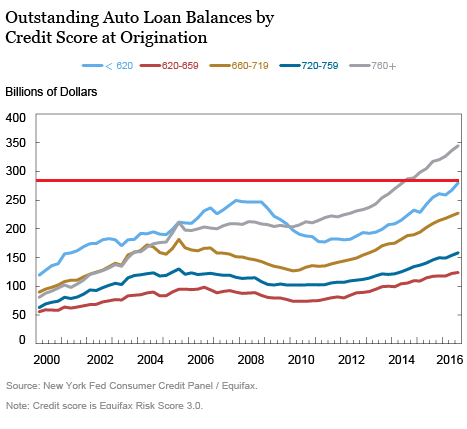 By contrast, auto loan balances to borrowers with the highest credit ratings (above 750) continued to increase throughout the Great Recession, though at a subdued pace. 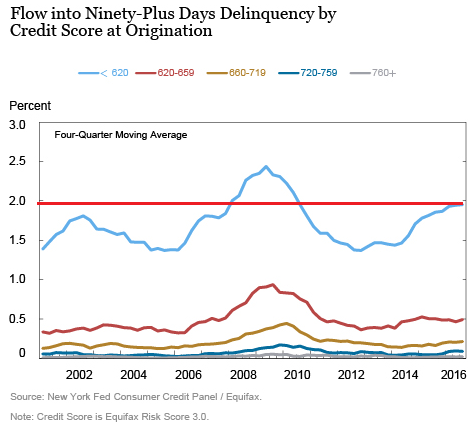 An even sharper divergence appears in the new flow into delinquency for loans broken out by the borrower’s credit score at origination, shown in the chart below. The worsening in the delinquency rate of subprime auto loans is pronounced, with a notable increase during the past few years. Note how the subprime delinquency rate (I added the red line) already exceeds the peak during the 2001/2002 recession and is approaching the peak during the Great Recession. So we’re getting there. So what’s the risk of auto subprime to the US economy? Unlike mortgages, auto subprime isn’t big enough to blow up the entire financial system. But it has propped up auto sales. Loan terms have become ever longer, loan-to-value ratios ever higher, as specialized subprime lenders have jostled for position to grab these deals. Nearly a quarter of all auto loan balances are subprime. This is a big part of auto sales. If subprime lending spirals down into losses and lenders keel over and others pull back, as they did during prior credit downturns, people with subprime credit scores will have a hard time buying vehicles, particularly new vehicles. And that’ll hit the auto industry – not the financial system! During the Great Recession, borrowers with high credit scores continued to add to auto loan balances, while subprime borrowers got pushed out of the market, as the second chart above shows. This was one of the reasons auto sales collapsed. Subprime lending once again has been key to the US auto boom through 2015. And this boom in the auto industry has been a massive prop under the otherwise shaky US economy. That’s how problems in subprime auto loans will inflict pain on the economy. So now people are struggling with paying off zirp on a brand new product, they should stick with what they’ve got and pay it off. The only next step to kick the can is nirp. Manufacturers can borrow big at nirp and sell cars at zirp at lower prices while cutting quality further (quality deflation, net product inflation) and make a fortune, sending their stock values higher still. And that still ties in nicely with the ‘war on cash’ idea, since it’ll be the 99% that pay in net pay cuts and saving/pension value erosion. They lose their wealth to support car makers selling them cheaper made cars at a subsidy. If only people woke up and just stopped buying stuff they couldn’t really afford it’d help correct this bubble. The newer the cars they buy the more likely they are to have built in obsolescence too. I’m sure they’re great to 5yrs/60k miles, but after that? As good as a pre-crisis car? You’ve got this backwards. Anecdotes aside, new cars are lasting longer than ever. 250k is the standard they’re being built for. The measure of new cars won’t be known till they’re old, they’re still new so how can you say they’ll last longer yet? I agree new cars can do higher miles while new better than they used to. But as they get older? Cars can certainly become uneconomically viable to keep going sooner the more complex they become. Time will tell, but costs must certainly have been cut in many places on newer cars, and at some point that will cost down the line! I can afford a new car, but I own a 2004 Prius and a 2005 Subaru. I can afford a bigger house and better furniture. I live within my means and owe nothing to the banks. I don’t need to keep up with the Jones’s next door to feel good about myself. Get rid of those batteries – quickly! If car manufacturers don’t start making efficient electric cars, they will be bankrupt in a few years. Climate Change is real and coming on fast. Everything is about to change _ continuing to live in illusion is not an option. The Arctic is 36 degrees warmer this winter. 100 million dead trees in California. Our denying reality is over. We need more than electric cars. We need to get a lot of the big trucks off the road onto rails.. And we need to make our rail system electric instead of diesel/electric. We need to improve our cross country passenger rail system too so we can quit using so much jet fuel.. And quit all these unnecessary costly wars. But that is smart infrastructure and we don’t have smart leadership in this country so get use to the climate destruction as it is going to get a lot worse before any of those living in the clouds (or Trump Towers) are even aware of it. Most of the problems seem to arise because the existing industries and interest groups have captured the regulatory agencies which were intended to control/limit them, thus maintaining the status quo and their economic advantages. Its an old story – the pack train operators fought the canals, the canal operators fought the railroads, the railroads fought the trucking companies and air lines, etc. The consumers and tax payers paid for all the fun and games. Well said. Reality is easier to deny than it is to accept. lol lol lol lol lol………….thats pretty funny …….. Speaking of shock, I think we have a shocker of a mark- to- market coming here. Are these vehicles that the guy has pretty much given up on, having oil, filters etc. changed? The sub-prime will be the worst of course but I wouldn’t be surprised if the entire auto loan book is only 50% backed by its collateral. It might not take a recession to cause the whole pyramid to cascade in on itself. The 2008 financial crash didn’t cause the housing crash, it was the other way round. If we get too many vehicles for too few buyers, and production isn’t cut fast enough, we could see a vicious cycle develop where so many units are so far underwater that even the non sub-prime guy walks away. It is possible that you get the 45, 000 car, two years into a lease being worth 15K. Look what happened with real estate. Then it’s too late to have a 2 week, inventory re-balance shut down of the plant, because only a lunatic or a fastidious person is going to pay triple for a new unit. The manufacturer might need another bail out. Which manufacturer? If the Fed begins tightening, the US$ could really take off at the same time the yen and the euro get even weaker. I’m Shocked that people who say “I don’t have any money” are behind on payments…… How could this be happening……. I know,was shopping for a car last week and the sales person was really exited,”you’re the first customer with a decent FICO Score in weeks” needless to say,the price of that SUV just came down considerably…. I’ve been trying to reconcile why new car prices are so high, it’s the low credit scores! You guys figured it out I think.. So we need another round of cash for clunkers, that ought to resolve this sea of upside down loans. Just socialize the losses. Why are almost all products high in price? Productivity should have lowered them. They are high because of the leverage.. Everything is leveraged and all that leverage means that there is interest paid at every level. Buildings, machines, transportation, even the stock prices are used as an asset. It works like a value added tax except it goes to the financial engineers like GS. This is the job of the FED and why the theft is so underhanded and mostly invisible. In their language it is called unlocking value. Regulatory requirements like Tire Pressure Monitoring System (TPMS) – because someone died when their under-inflated tires failed and they never bother to look at their tires before driving, also cause automobile prices to rise. These sensors cost $50 per wheel on my car and that doesn’t include the cost of the rest of the monitoring system. Just wait until humans are judged unfit to drive compared to fully automated vehicles and the price of a ‘cheap’ new car will be $75,000 or so. I had to replace a leaking tire pressure monitor on my Lexus and the dealer charged US$200+. It was out of warranty. The airbag shocks are about US$2500 each if they have to be replaced. So you add up all the bells and whistles and you have a US$75K car. After dealing with these two issues I now look back and realize it was not the smartest deal I’ve ever done. Too bad Bernie was not elected, he could have expunged all these auto loans along with the student loans and all would be hunky dory. And who is going to pay for that? but i assume you were being sarcastic,you can’t tell these days…. The bond collapse is predicted on stiffing creditors on a much wider scale than Bernie or Hillary ever dreamed was possible for a president. Given the attitude of his supporting cast of swindler your entitlements are in the cross hairs. I hope you don’t depend on government entitlements because stiffing you is the main priority save 4% inflation escape velocity? We stiff our creditors and everyone can forget about affording food and other cheap imports? Tom, I see stiffing the entitlements as a huge negative for the economy. We already have over production and over capacity with out enough consumption. Withdrawing more consumption and putting all those people in even greater jeopardy seems to me to be a receipt for revolution. Watching Donald pick people to represent him in the government is like watching a Idiot fool with a land mine. He obviously has no idea what he is fooling around with. Or he is Insane! During the election some referred to him as a sociopath.. Maybe they were right? RE: I see stiffing the entitlements as a huge negative for the economy. We already have over production and over capacity with out enough consumption. Withdrawing more consumption and putting all those people in even greater jeopardy seems to me to be a receipt for revolution. Indeed, but “austerity” is the new economic panacea, the same way that blood letting is a sure cure for anemia. ;-( For some results see Greece, Argentina, and Kansas. Sad that those in the clouds (towers) seem to believe that they should always benefit and the workers should always pay (except for a few grand standing events whereas the workers are benefited.. Slight of hand, never watch what they want you to watch, always watch how they *fix* things to always in the end, benefit themselves. As I recall, Edward Snowden stated “2016: a choice between Donald Trump and Goldman Sachs.” Funny, that! Minsky said “Success breads excess which leads to crisis”! To bad that crime pays so well for the well connected! Months late and billions of dollars short. Any estimates how mush this is going to cost the taxpayers? Let’s try to keep some basic facts straight. Italy has a referendum on changing some details on how it governs itself, how much power the Senate has v. the Parliament, etc. There is NOTHING in the referendum on the EU or the euro. It’s about internal governance. If the referendum fails, there is a chance that there will be new elections maybe next year, and then there’s a small chance that the 5-Star movement might win, and the 5-Star movement has campaigned in the past on shedding the euro (the currency) and reverting to the lira. But Italians like the euro. They like having a currency that doesn’t get crushed by their government every 30 days. So dumping the euro is not going to be easy in Italy. But leaving the EU is not on the agenda of any major political group and it’s not going to happen anytime soon. There is the wrinkle that came up in the greek sagas. That allegedly you cant leave the Eur and stay in the EU. I never got the details behind that. Or weather it is fact. Otherwise saying a state bailout, without a bail in, is getting closer. I an a Brit living in Italy and I can confirm that the sentiment in Rome ( where I am located and have the majority of my friends), seems to be a NO vote. That being said there is a polarity between North and South, generally speaking. 2 things to note are that 1. a vote for NO is not necessarily a vote against the establishment. I would actually go as far to say that it is a vote for the establishment. Italy is bloated with high paid politicians and political interests. You could argue that a vote for NO would be a continuation of the current establishment. However, the YES vote would land a lot of power in one parties hands and therefore you would be relying on a very honest and forward thinking and not so self interested government to lead the way forward afterwards. Not something Italy is famed for! The 2nd thing is the idea that a NO vote would lead to a 5 star surging into power. In reality it would be much easier for them to surge into power if there was a Yes vote. Under Italy’s current system coalitions can be formed after an election to increase the vote for one party. This is what blocked the 5 star movement from power in the last election after they won approx 30% of the popular vote. The fact is that a NO vote would make it harder for them to be in power but a yes vote, if they won by a small majority at the next election, would be a much higher probability in my opinion. That all being said the average Italian is too politically astute and too concerned with the idea of a true democracy to allow such reforms to pass. Their memories of their facist past are too raw to put too much power in one persons hands. I think it will be a narrow NO win. One last thing to add is that on talking to the younger generation, they all seem to be clearly in the NO camp. However, a number of the older generation seem to want change and want the economic gains they remember in the past? Sound familiar? We shall find out soon. John, I can tell you that alot of Italians blame the current crisis on the Euro. Alot of people in the cities and especially in rural areas blame the euro for their plight. As a Brit living here I was patted on the back many times after the BREXIT vote and it was hailed as a great thing. (I should note that I was a REMAINER even though I know you are not), That being said alot are closely watching the outcome of Brexit to determine how they would vote should they ever get the chance of exiting the EU. Whilst the idea sounds great they prefer to see in practice what the impact would be. The UK, is to many mainland Europeans, the Guinea pig in this particular experiment. However, the Euro, and bad sentiment towards the Germans is on the rise. The longer the EU keep on the current path the more likely that more Italians would vote for 5 star and look for an escape route. Unfortunately for them, the escape route would likely mean more corruption and power back to the Italian establishment. The very people they need to escape from. George Orwell’s Animal farm springs to mind. A lot more circus the bread is about to fade away! Throw open the grainery the people have suffered for so long! With full bellies we can take firm action to refill the grainery even higher then before and before that. First we must find the individual who can break that lock and than we find the individuals who put the lock on in the first place! Nothing is going to change in Europe until Jamie dimon buys the entire Italian banking system with a two dollar bill? Subprime people probably aren’t getting 0% though. Was just reading a story the other day about someone who foolishly bought a Tundra. He was at something like 6% for 72 months. His total payout was something like $70K on a $40K truck. He was having a hard time swinging the $900 a month payments. At least a Toyota will probably last 72 months without major issues. $900 a month? For a truck? That’s more than what I used to pay on my mortgage! Attorney general storyboard to follow? I never fail to be amazed when a carmaker like Mercedes brags about the 40 computers on board- I don’t even have the courage to look up the replacement cost of one of them after the warranty ends. That said, I just bought a 2003 Accord with a stick shift- I would have picked one with wind up windows as well if I could have found one. Whats quite telling is the finance cost are in the price of the car. Toyota likely pays less than 1% for capital to finance sales. They likely add 2 to 3% to the price of the car and make money on the vehicle and the loan. Low interest rates on new cars is a scam job that allows people to finance cars they can’t afford. I bet the manufacturer’s and dealers have the repo loss cost spread out in the sale of every vehicle as well. If anyone is in the auto sales business please confirm or set me straight. Indeed Bookdoc my thoughts as well. I am also quite skeptical that the NY FED worries about anything. It is not like loose lending standards should be a surprise. If you give monkeys a box of hand grenades one should never be surprised about the outcome. My guess is that they are more worried they will get the blame. Worried might not be the word. The lenders got desperate for reportable yield and, especially on the subprime side, it led to higher risks and those all important higher yields. Risk does mean risk even in a ZIRP world. There will be heads rolling if (actually-when) the bubble bursts and loans dry up. These ivy league trained economists will still be talking keynesian doctrine and the direction of the auto loan crash reverberations will be way beyond their theories. It will be interesting to see the fallout. I hate to see Keynes dragged through mud created by Friedman. Keynes would never had advocated for Fed manipulation of interest rates to boost a depressed economy. He would have advocated for direct government expenditures. However, Friedman, a Libertarian, needed to have a way to de-Keynesianize (new word) the political system because of the huge success of the economy in the ’60’s and ’70’s so he came up with monetarism and interest rate manipulation. He thought it would create a successful economy where people would praise the private sector instead of the government for their success. Greenspan, another Libertarian, implemented the policies in a way that appeared to be successful in the 90’s and early ’00’s. But that is what put us where we are today. Not Keynes. Indeed! The Keynes economic model no longer applies, largely because increased domestic consumer demand is no longer met through increased domestic production. While governmental [deficit] spending and NZIRP/QE does increase consumer demand, e. g. vehicle sales, by and large this does not contribute to domestic long-term domestic productive economic activity, but simply increases the current account trade deficit as imports increase, although the consumer products purchased may still have historically domestic brand labels, e. g. vehicles, appliances, consumer electronics. So you think surreptitiously printing money in the basement trumps (as it were) interest rate manipulation? In his General Theory, Keynes wrote that the benefits of deficit- spending -job-creation are immediate, whereas the attendant inflation is only realized later, and more slowly. The triumph of sophism. That is exactly what America should have done Not QE 2 and 3, but 20/20 hindsight is a wonderful thing. Although I did say after QE 1. INFASTRUCTURE. The attorney general of new York usually panics long before the fed even knows a problem Is forming! A.G.s love the spotlight quite a bit more than a fed bank does! For a detailed account please reference the beginnings of the great recession focusing more on causes than on effects. Is there a scenario where this doesn’t repeat exactly like 2008? What method of can kicking can be implemented to ensure everything keeps going well in the make-believe world of fractional reserve banking? I’m stunned we’re even here with a semblance of normality. I’ve been reading doom and gloom for the best part of 8 years and to be honest the most consequential thing that has happened to me is my progression in the practice of Kegel Exercises. You mean in I insure you and you insure Petunia and she insures Kitty and Kitty insures Wolf and me and Petunia and you with not only no set asides but all the available capital is leveraged to the max using the insurance we all have against one another as the asset supporting it all? Less mom and pops to go under! Popcorn becomes a bigger seller at Walmart than bananas? They can extend and pretend again, with 100 year bonds. Remember it is the full faith and credit of the US govt. Coming soon to a pension plan near you. Who in their right mind would buy a 100 yr bond? For at least a century the Bank of England sold perpetual bonds- they never came due but for the era had an attractive coupon or interest. It is easy to forget how recent the modern era of inflation is- a bottle of coke was 10 cents ( 5 for the small one) for 50 + years. On some of those American Picker shows, they buy vending machines from the 40’s or even 50’s for gum etc. that have the price cast into the metal. I can still remember the first time I ever had to put more than one coin in a coke machine. A quarter wasn’t enough. It would have been about 1975. The kick off was the 1974 Arab-Israeli war and the sudden rise in the price (and availability) of oil. Since then the idea of the long term bond has taken a hit- but Mexico just sold some 100 year bonds. I assume they are US$ denominated, and must have an attractive interest rate- because of course that’s the only reason to buy them. As long as it is a saleable bond, from a stable source, it doesn’t matter, its just a paper store of Liquidity/Wealth. I need somewhere to put my Billion’s, you know. They could always wave the Perpetual wand, at 1%. Then run them until they had some money and could buy them back 80 or so years later if the interest rate was negative 10%. Effectively what England did with a lot of its WW 1 bonds which they refinanced just a couple of years ago. I have seen a story on Zero Hedge that claims that 34% of new auto loans include rolling negative equity on trade-ins into the new loan, an average of about 4,000 dollars per loan. I am surprised it is that low as well as that low a percentage. Before I retired last July, I would say that close to 50% of my non-cash customers rolled some negative equity into the new vehicle. Anecdotal, I know, but thought I’d mention it. If their vehicle is repossessed, most of them can raise 1000$ to buy a beater! The automakers are the segment that will take the biggest hit when credit stops to the subprimers! $1000 doesn’t buy you much these days. For $5000-6000 though there are any number of 10 year old cars with an easy 50K miles of life left in them. An Accord with the 4 banger for instance. No timing belts and as long as it’s newer than 2005, you probably won’t have transmissions issues till you hit 200K miles. Subprime people probably can’t even afford a $5000 car though. It’s easier to buy a new car than it is a $5000 used one. I’ve read stories about people buying a new car because they can’t afford the $1000 it would cost to replace the tires on their existing car. A grand for four tyres? Do all these people drive Ferrari’s around? No timing belt? Timing chain? From only the vehicle perspective (among many) these subprime negative equity 72 month loan bearing canaries in the economic coal mine know that BIG CHANGE is necessary and that they have no chance of making it in today’s US of A, so they voted for Trump! whose proposed commerce secretary’s company presided over 40,000 theft of home foreclosures. No wonder private prison stocks shot up 40% the day after the election – lots of rooms will be needed for the malcontent 99%ers. Ok, but a lot of actions that led to many forecloses were fraudulent, right? Unfortunately a lot of us saw many problems with the way lenders worked and I personally believed that they were guilty of violating their fiduciary responsibilities but the gubbermint let them go on and on and on. So Fraud is either just an antiquated concept of old English Common Law or is a fiction in our laws. At least for the largest corporations. Apparently the US has either dropped the pretense of fraud as an actionable law or distorted it so much that it might as well no longer exist. It is not fraud when a politician lies, even about another politician. It is no longer fraud when a lender lies or ignores their fiduciary duty to you. It is not a lie for corporations to hide their debt levels using obfuscating accounting as in Level 3. Fraud as a legal concept only exists for us peons. Much of this apparent “fraud” can be traced by to the evasion of the state land registry system [and transfer fees/taxes] through MERS [mortgage electronic registration system], and to the complexity/ineptness of the MERS system, which appears to lack any oversight/monitoring. IMNSHO the cheap [for the taxpayer] fix for this is to legislate that the only [identifiable] entity that has standing to initiate a foreclosure action is the one which has a property lien registered with the state/county. The foundational problem appears to be that the ownership of the various property liens, primarily due to “securitization in structured CDOs [collateralized debt obligations] is diffuse, and tranche ownership of the lien within the CDO is not fixed as it depends on the delinquency of the loan. This entire system is against most state laws that require every ownership transaction to be recorded in the county where the property is located. The TBTF institutions illegally circumvented the states rights and state laws and NO ONE from the federal government did a damn thing about it.. Dodd-Frank as far as I understand it, does nothing to stop this illegal (fraudulent) practice. In other words, those with the power, pay no penalties. The further down the ladder you go, the more everything you do is at risk. Especially when dealing with the financial elite. This leaves the real, actual ownership of properties that had foreclosed mortgages which were bundled and resold in question. Who really owns those properties? It is theft when the govt has made the bank whole and they still take the house. RE: Foreclosure is not theft. It is if you don’t have a valid lien. When I worked in Banking. What America does with “Sub Prime”, was defined in our country, as predatory lending. And still is. As in many cases the borrower, can never pay off, and has never had the ability top pay off, the total I and P, on the original loan. Not directly. Leading up to the financial crisis the FED kept raising rates until they created the ARM domino default effect they desired. The setup was Greenspan advising Americans to get a big(er) more expensive house with an ARM. Now I expect small homes should be the coming rage or has the apartment boom already beat me to it? Anyway, you’ve got to live somewhere just as you’ve got to eat. Wolf, your website never mentioned anything regarding war on cash, like in India. Are we going to see that in USA? Here are some of our articles on the “war on cash,” including two recent ones on India. In India, it was more of a war on corruption than on cash. We’re not going to see anything like this in the US. In the US, electronic payments are booming, and cash is dying a natural death (propagated by Corporate America). The younger generation doesn’t even use cash anymore. There is no need for the government to do something like India did. A lot of US cash (mostly $100-bills) is held overseas as store of value in countries that crush their own currencies. So you don’t think there will be one global currency like 1989 economist magazine predicted. USA is corrupt too, just like India, right wolf. You’re conflating “currency” and “cash.” The “war on cash” has nothing to do with “currency,” global or otherwise. We don’t need cash in the US to be corrupt. We have codified most forms of corruption at the government level and made it legal (“lobbying,” etc.). If you stick to these rules, you won’t have any problems. No cash payments needed. Bank transfers are fine. SDR is where the real printers go to print! IMF / fed chair/President/american people? The “War On Cash” is nothing more than a wealth transfer and a method to gain absolute financial control over a populace. No matter what “excuse” is used by TPB eg: corruption, crime, money laundering, public wealth security, etc. These are nothing more than a thinly veiled smoke & mirrors ploy to fool an increasingly non-critical thinking peoples. “The increased level of distress associated with subprime loan delinquencies is of significant concern, and likely to have ongoing consequences for affected households,” FED says. Lets see, your government subsidizes the sugar industry, mostly the corn sugar, get folks (and especially kids) hooks on sweets and sodas, and then they get diabetes that cripples the rest of their lives. So you, as the government, come out with a warning that sugar can cause diabetes, but you don’t stop the subsidies. This is what the FED does, destroys the health of the nation and then acts surprised, but doesn’t stop their criminal manipulation. Another factor making things worse in subprime this time around is the higher number of borrowers who fell for the “we pay off your trade no matter how much you owe” scam and are now paying high interest rates to finance a car they no longer even own. Wolf, given your experience in the car business, do you know what the limit is for negative equity that can be financed? I recall the NINJA Option ARMs had caps of 120 or 125% LTV, after which those loans reset (and then blew up). I assume there is some limit to the amount of negative equity that can be financed, but don’t know what that is. Ive seen 10k in negative equity rolled over in Florida and Texas. The ugly truth is hidden again. People are literally cash poor and we see this and wonder why??? Financing negative equity has been standard practice in the car business for decades. By definition, if you finance the purchase price a new car, you instantly create thousands of dollars in negative equity because the car, once it is registered, is a used car and worth a whole lot less. If might take three years or longer of payments to overcome this negative equity. If the trade-in is upside down, that increases negative equity. If you also finance tags, taxes, and license fees, you increase negative equity. Etc. This has also been done for decades. But the extent to which negative equity has risen and is getting financed is probably new. The numbers you see on negative equity are based on the book value of a car. This is OK for new vehicles because the “book value” is known. But used vehicles have an actual value that may be very different than the stated “book value.” For example, you can look up a car with 50,000 miles and in “excellent condition,” and you get one book value. But if this thing is really beaten up, the book value should reflect “in poor condition.” The lender that approves the loan – a machine, usually – doesn’t actually see the car and doesn’t know this, and will approve the loan if it is under their limit of the loan-to-value ratio. In reality, the buyer’s negative equity could be far greater. This will not be an issue unless the buyer defaults on the loan (the loss for the lender is greater than expected), or unless the buyer wants to trade in the car during the first several years of the loan, and can’t. Before I left, the general limit on new cars was 110%. However, the captive lenders would go 115% for those with 700+ scores. We’d actually have used car guys bring people with negative equity up to new cars to try to get them done. There were exceptions and usually targeted on hard to move vehicles like extended cab pickups certain slow moving cars. The used car market was more difficult as, due to the socioeconomics of our clientele, we did not have a custom (secondary) finance department. Since we generated so many high credit score loans, we could occasionally get someone over 590 approved at non-usurious rates. We rolled over a balance into a new car because the old one was getting expensive. With a longer term the new one was $10 a month cheaper than the old one. One issue that is rarely mentioned is the cost of car tags. When we first moved to Florida tags were under $200, when we left they were over $400. My husband turned down a job offer in California because of the taxes, and then someone told us that to get tags in California can cost thousands per car. We definitely could never have afforded it. Where we are the tags were over $600 per car. It is really a ridiculous ripoff. Not to defend California’s obscene tax structure, but I think what you were told about car tags was exaggerated. Fees on my wife’s new $40K car were $405 in 2015 and went down to $385 this year. We have a slew of taxes and fees on vehicles registered in California, including one-time taxes and fees at purchase (which are massive) and lower annual fees. You’re talking about the annual fees only. I just went to the DMV’s Fee Calculator…. and figured the fees and taxes at purchase of a $40,000 gasoline powered car purchased on Nov 30 in San Francisco County. enjoy, it’s far worse in Europe. In my country you would be looking at $10.000-15.000 extra for a not-so-clean American car. The current fee (BPM) depends completely on estimated CO2 pollution; cheaters who bought VW diesels probably laugh all the way to the bank while still demanding ‘compensation’ from VW for their dirty diesel. And on top of that catalog price + BPM fee comes the 21% VAT ;-) Of course, there’s also significant yearly fees. I think that includes sales tax. I bought a car in CA last year and the fees (not counting sales tax) were $373 on a $26k purchase. Registration this year was about $250. If you include sales tax, which I did not, the dues on my wife’s car when new go up to about $3919. I paid less than that for my entire first new car. In CA the tag costs are based on value and go down as the car depreciates. You’d have to have a new Ferrari to pay thousands for tags. Of course, you still get hit with the smog inspection racket every few years you own the car. Here in BC there is a total of 11.5 % tax on any car registration- by the time a car is on its 4 th owner the govt has made more than the manufacturer. So obviously the gov is kicking back a set fee per reg not a percentage. The cheerleadering was not present last time! The U.S. civil war never ended, and is now conducted for political advantage. The U.S. is not the world’s policeman. It is the prison guard for half the planet, and runs a shakedown operation with several of the inmates. They can’t purchase it – they borrow it. If they want to confiscate your farm by forcing you to sell, they simply raise the property tax to a level you have no means of paying. Muni;s are crashing, similar to 2008. Doesn’t that process require a banker in a top hat with a long sinister mustache tying your lovely daughter to a train track? Mnuchin is that man Night-Train. Pathetic. Insider and drain swamp LOL. Sucker’s are born every minute and every Red State funded by Blue State prosperity voted for the new King and his ilk. Doesn’t that process require a Socialist tax collector (Extortionist) with a long sinister mustache tying your lovely daughter to a train track? Bankers don’t set property taxes. Socialist extortionist do. It all goes to the Credit Union rollback, 25% is too low [i can tell stories about how tight they can get, circa 2008]. CUs are the only ones doing any real banking (due diligence), ergo its time to expand their role in SB lending. which is opposed by the big banks [who do little in the way of real banking, but plenty of financially engineered profits – who cares if they get a rate hike, they don’t] The CU’s are hunkering down ahead of the storm. A rate hike might actually help their business, although the S&L conundrum, too much interest to depositors and not enough loan demand remains an issue. Collateral is dead, long live collateral, credit will remain the only path to ownership .